Naomi Osaka is hogging the headlines for all the right reasons in her native land after she became the first Japanese player to reach a Grand Slam singles final, with one major newspaper hailing her as 'a new heroine Japan can be proud of'. 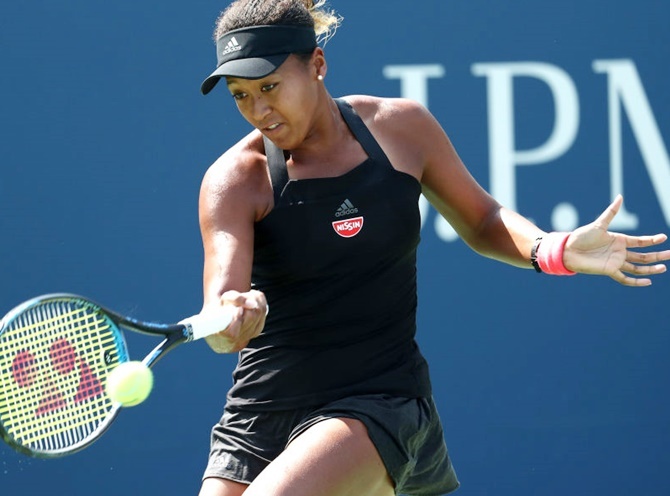 The 20-year-old, who faces idol and 23-times Grand Slam champion Serena Williams in the US Open final on Saturday, is also helping break new ground in Japan due to her multiracial identity: the daughter of a Haitian father and Japanese mother. She's one of several young mixed-race athletes who are challenging Japan's traditional self-image as a racially homogenous country, including sprinter Asuka Cambridge and baseball player Yu Darvish. "Her Japanese isn't that good, right? But the way she tries to speak in Japanese is so cute," said Yukie Ohashi, a 41-year-old Tokyo resident. "My impression of her is that she sticks to her beliefs and is powerful." The Asahi newspaper described how Osaka's unpretentious, sometimes humorous responses in post-match interviews and news conferences have won over spectators and journalists alike. Osaka also has a strong attachment to Japanese culture, describing her visits to the country as like a "super-awesome extended vacation that I don't want to leave", according to media reports. "The combination of her strength and childlike innocence is her charm," said the conservative-leaning Yomiuri, another major daily. Tennis is not as big in Japan as baseball, soccer or sumo, but Osaka's 6-2 6-4 semi-final win over Keys made the front pages of major local newspapers on Thursday -- although it was dwarfed by news of the earthquake that struck the northern island of Hokkaido earlier that day. While Japan is becoming more ethnically diverse -- one in 50 births is to interracial couples -- there is still plenty of prejudice against "haafu", or half-Japanese, including cases of bullying against mixed-race children. When Ariana Miyamoto, the daughter of an African-American man and Japanese woman, was selected to represent Japan in the 2015 Miss Universe contest, the move was widely criticised on social media, with some saying she did not look truly Japanese. At the 2016 Rio Olympics, Mashu Baker won a gold medal in judo and sprinter Cambridge anchored the silver medal-winning 4x100 metres relay team. "For sure, we will have more athletes like her who are half-Japanese as athletes become more international," said Hiroshi Nakamura, a 65-year-old fan of Osaka, who works at a real estate asset management firm and plays tennis regularly. The pair have met just once before, with Osaka stunning Williams 6-3, 6-2 at the Miami Open in March. The final will be played at 5:00 a.m. Japan time on Sunday and even if she fails to pull off a stunning victory, the Asahi newspaper believes Osaka's U.S. Open run could hail the beginning of a generational shift in women's tennis. "She's a new heroine that Japan can be proud of," the Yomiuri said.